Spring time…and the drinking is easy with fruit flavored cocktail recipes. My take on an old tune! I am a great fan of lemonade. I drink it all the time when I am gardening and find it very refreshing. This recipe for Watermelon Raspberry Lemonade gives a new twist to the old favorite – sans the alcohol of course. Not sure what my garden would look like if I made the adult version! The recipe combines watermelon cubes, raspberries and fresh lemons and is easy and quick to make. To serve it as an adult drink, simply add a little rum, vodka or gin. It is the perfect way to welcome spring and share a new drink with friends. For more drinks and cocktails, please visit my Pinterest cocktail board. Do you prefer your lemonade with or without alcohol? This recipe for Watermelon Raspberry Lemonade gives a new twist to the old favorite - sans the alcohol of course. Not sure what my garden would look like if I made the adult version! Place watermelon, raspberries and water in blender, cover and blend until smooth. Pour fruit water into the infusing basket and add sugar and lemon juice, stirring until sugar dissolves. Refrigerate at least 1 hour. 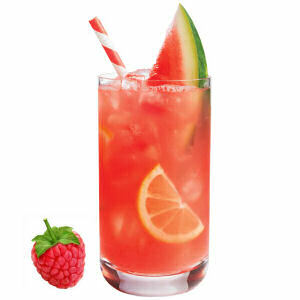 Serve over ice in glasses garnished with more fruit.